All serial numbers are posted on the outside packaging of every shipment. We also have a website where you can retrieve all this information and more about your order. Please click here to review your order status. We work with the postal service and UPS to ensure that all orders are packaged and shipped within 2-business days. If you have not received your product within 14-days of shipment, please send us an email, or call our customer support line. If you would like to know when your order was shipped, please visit the following link: Order Status. How do I re-license my program for an additional year? If you requested your program more than one (1) year ago and it has expired, please feel free to renew your license at the following link: License Renewal. The problem is usually caused by old information saved in your browser's cache. if you want to use the same browser then you need to clear your cache--that will usually will fix this problem. Internet Explorer: go to the start menu, then click on the control panel, then click on internet options, click on general and you will see where to delete the browsing history and cookies. Once you select this click on ok or apply. In chrome: go to the top right hand side of the page and click on the icon with the three bars, select history, clear browsing history (select the last 4 weeks) and check clear the cache. You may need to restart your computer. Please contact our customer service department if you should have any other questions or still cannot login to the program. My DVD disc doesn’t seem to be working with my computer. First, ensure that your computer has a DVD-ROM drive to read this type of media. A common problem is confusing CD and DVD drives. DVD drives will run both CD’s and DVD’s but CD drives only work with CDs. So verify you have a DVD ROM drive first. A good test would be to place a DVD movie in that same drive, and see if it plays. If you have confirmed that the drive is a DVD-ROM and the disc still isn’t working, please call our customer support line for further assistance. 1. On some apple machines the icon to the far right "Start" won't work...you can see here it has a cross through it. 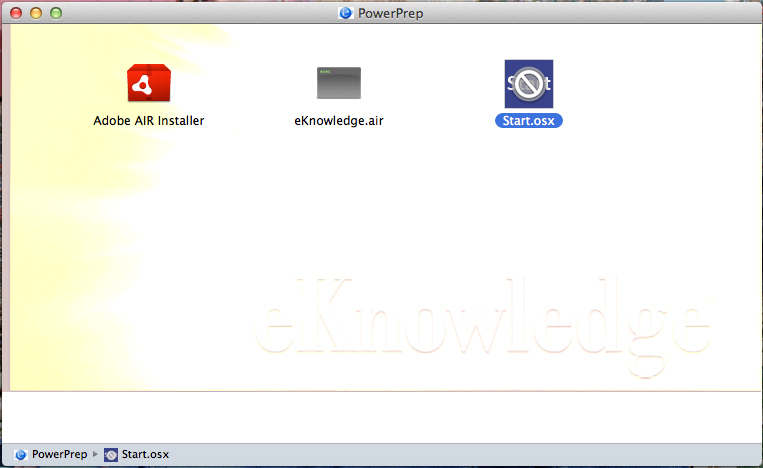 Either way, all you have to do is click to install the adobe air file and then click to install the eknowledge.air file. Yes (but see notes below). The PowerPrep software is built on the Adobe Air platform and will run on both a PC and a MAC. Adobe AIR is supported on Windows, Mac OS X, and numerous versions of Linux. Note: Windows 2000 and Mac PowerPC are not supported with AIR 2. Users can install and run AIR 1.5 applications, but will not be able to install or update to AIR 2. Mac OS 10.4 running on an Intel processor is supported for running AIR 2 applications, but is not supported as development environment with the AIR 2 SDK. IS THERE A WEB ONLY VERSION OF THE POWERPREP? Yes--we have a full version of the PowerPrep available for web only. IS THERE iAPP VERSION OF THE POWERPREP? We are working on an iApp version of the PowerPrep. WHAT IS THE LICENSE PERIOD FOR THE SOFTWARE? The SAT/ACT PowerPrep software programs available through the eKnowledge Sponsorship Alliance comes with a one-year renewable license that activates at the time of purchase and continues for one year. The license is renewable.